TORONTO – Veteran NHL referee Bill McCreary will officiate his final NHL regular season game tomorrow night, when the Washington Capitals host the Buffalo Sabres at Verizon Center, the National Hockey League announced today. The site will be appropriate as McCreary began his four-decades-spanning NHL career by working a Capitals home game. McCreary's debut as an NHL referee was on November 3, 1984, when the Caps hosted the New Jersey Devils at the Capital Centre in Landover, Md. Tomorrow night's game will be the 1,737th of his accomplished career. There's no better time to put a smile on the face of a child than right in the middle of the holiday season. That's precisely what members of the NHL Officials Association were thinking when they decided to put Grand River Hospital in Kitchener, Ont., on their tour of visits during their Zebras Care initiative. On Tuesday, linesmen Greg Devorski, Scott Cherrey and David Brisebois and referee Dean Morton will pay a visit to long-term and out-patient children in an attempt to make their day extra special. The visit, which begins 1 p.m. ET, will have the officials in two units -- an out-patient children's clinic and an in-patient ward. 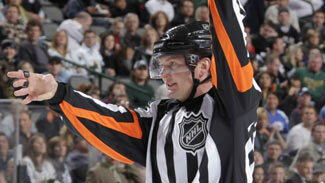 NEWARK, N.J. -- How many hockey fans out there would love to throw a snowball or 10 at an NHL referee or linesman? Matthew Villacis, 9, lived that dream Monday night as he took aim at linesman Mark Shewchyk, standing in front of a goal in the Zamboni bay at the Prudential Center, home of the New Jersey Devils. "One of the kids wanted to see where the snow was and so for something fun to do, I played goalie," Shewchyk told NHL.com. "I knew he would love that. I try to have fun with the kids." In this case, there were no game misconducts for throwing something at an official. Instead, Villacis and three of his teammates from Hockey in Newark were the guests of the on-ice officials for that night's game between the Devils and the Washington Capitals. DENVER -- Marcus Vinnerborg, the first European-trained official to work in the NHL, doesn't really see himself as a pioneer. "Of course, you're the pioneer when you're the first one to do something," he told NHL.com after officiating the Colorado Avalanche's 4-3 overtime win against the San Jose Sharks at the Pepsi Center on Wednesday night. "To be honest, I don't look at it too much like that. I came here to learn from the best officials in the world and to adapt to their way of working, and to work in the best league in the world. "It's an opportunity I couldn't turn down. A pioneer or not, I would have come anyway. Hopefully everything works out well. So far I have had a very good start." Vinnerborg, 38, previously worked in the Swedish Elite League and has handled a number of major international assignments, including the 2010 Olympics in Vancouver and several International Ice Hockey Federation World Championships.